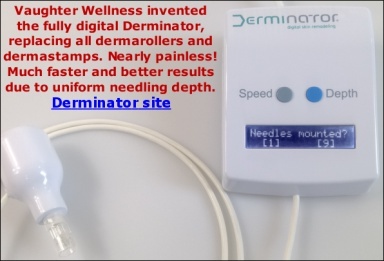 Dermarolling / Microneedling / Re: How often can I used the 1.0 mm dermastamp? Dermarolling / Microneedling / Re: Question about Dermarolling Video? She is demonstrating the correct technique, with the exception that she should be moving the roller a tiny bit sideways after every roll. The most important however was showing the movements themselves, the need to fully release the roller from the skin before you do the next roll. That prevents going into the same channels multiple times. Her technique would also be an acceptable one, as long as she creates a sufficient prick density in the skin. The main thing is to always remove the roller after every rolling motion. I recommend either the single needles or a 1.5 mm dermastamp with 35 needles. Needle or stamp it densely every three weeks.